If you leave Amsterdam before doing these 3 activities, you'll definitely be regretful. So make sure you try these while you are there! Maybe you are not aware of it yet but you are about to travel to a city that has 165 canals which is more than Venice! So it will be wise to view Amsterdam from these historic canals as it is the best way to be introduced to the most important city sights. Every year, more than 3 million tourists take canal cruises and there are 170 boats and over 1000 people that are recruited for canal cruising! And also same amount of people on a boat, produces less CO2 than the people in cars or buses. You can take the canal bus from many points in the city and the tours are available in many languages. So if you are decided to take a canal tour, first you should decide on which kind of tour is best for you since there are many different services available. You can prefer hop on – hop off tours to if you need to take a break for sightseeing or shopping or you may like to have your dinner at the boat. Chartering a boat for your special occasions is also another option. Still not satisfied with these options? Hire a boat for yourself and be your own captain! Among the best operators for canal tours, there are Lovers, Blue Boat, Holland International, Rederij Kooji, Canal and Rederij Plas all of which provides excellent services. 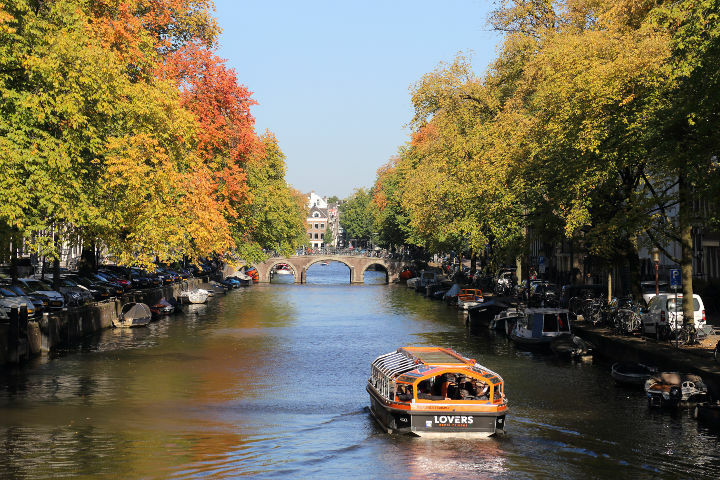 A standard tour will take about 1 hour and will give you the chance to see the gables, bridges, canal houses, houseboats and many magnificent sights of Amsterdam. One more thing to remember is that Amsterdam’s canal belt is recognized as UNESCO’s world heritage site. Besides, alongside the canals, various events are held every year like festivals or celebrations. If you are lucky enough to be in Amsterdam in April, get ready for an orange flow in the city. King’s Day is celebrated at the end of April each year and more than 700 thousand visitors join the celebrations. In August you will have the chance to experience Gay Parade or Grachtenfestival (Canal Festival) that will make you be fascinated by the classical music on or near the canals. Amsterdam has a very close relationship with bicycles. They are not only a kind of vehicles for the people of Amsterdam, but also they are their lifestyle. 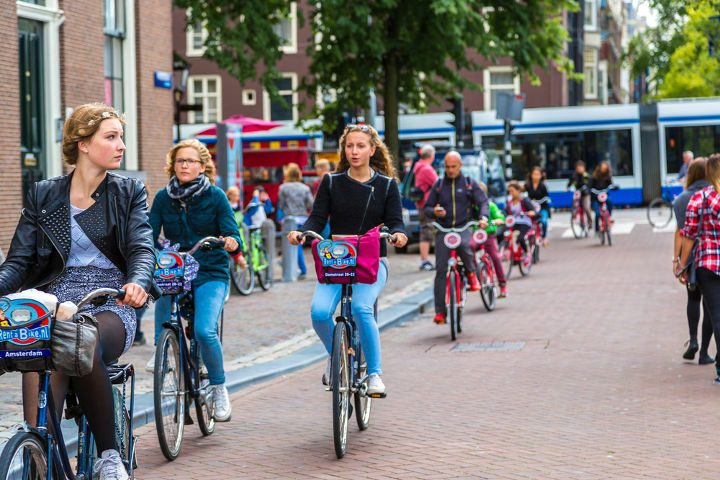 A surprising fact is that the number of bikes in Amsterdam is more than the number of people. When you are in this city, you will see mothers carrying their babies on their bikes or old people riding to their works. This being the case, Amsterdam streets are the perfect stage for viewing hundreds of people on their colorful and stylish bikes. So why don’t you join in that crowd? Pick your bike, wear your helmet and start to cycle! It’s undoubtedly the easiest way to get around the city. It is easy to find a bike rental shop throughout the city. Riding a bike is easy and safe in Amsterdam if you follow the rules that your vendor will give you. To have more information about hiring a bike in Amsterdam, you can visit Iamsterdam website. This article is written for the purpose of providing information. It should not be considered in any way as a promotion of these drugs. If you are intended to try weed while you are Amsterdam, coffee shops are the only places that are authorized for selling these substances. There are more than 200 shops in the city and they are never allowed to advertise. To identify them, you need to look for the green and white license sticker on their windows. When you go in there, it is common that you do not see any menu around because the promotion of these substances are prohibited. You generally need to ask for the menu and the experienced staff will give you what you need. You can always trust the people who are working in these coffee shops. They are ready to advice you when you need and they are here to make sure everything is safe for you. However, never rely on the people who attempt to sell any kind of drugs out of these licensed coffee shops. If you are inexperienced and do not know anything about these mind-altering substances, try to prefer the cheap ones because it means they are less strong. If you don’t how strong the weed you are about to consume, take a small puff and wait for a couple of minutes to feel the effect. And if you are trying hash or weed - in a space cake or pot brownies for example – it can take up 2 hours to show any effect so never eat them one after another. Using alcohol with these drugs may increase the after effects dramatically so it is prohibited in the coffee shops. So be sure you never drink alcohol before or after consuming these substances. For more information and further reading about the coffee shops in Amsterdam, you may want to see the guide of International Press Office of the City of Amsterdam.